Oakridge is a SW Calgary neighbourhood that borders the south side of the Glenmore Reservoir. Oakridge real estate includes mostly single-family homes. This large community has quiet streets and is nearby parks, recreations, shopping centres and many schools. Here are all the current homes for sale in Oakridge. Be sure to read more about this community below. Oakridge is located on the western edge of Calgary, just south of the Glenmore Reservoir. The neighbourhood is accessed by 90 Avenue South or Southland Drive. With lots of parks, schools and shopping within the community, Oakridge is a popular choice for families of all sizes and ages. Most of Oakridge real estate features single-family homes. Oakridge is similar to its neighbouring communities, which includes Palliser, Cedarbrae and Braeside. 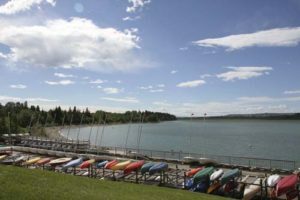 South Glenmore Park is in between Oakridge and the Glenmore Reservoir. The large park has shelters, picnic sites, fields, spray park, tennis courts and trails for year-round recreation. 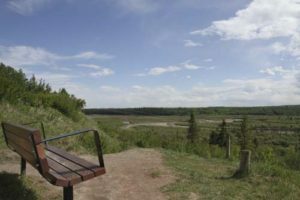 With views of the reservoir and the Weaselhead Flats, South Glenmore Park is popular for many Calgarians seeking a nature retreat within the city. Pathways within Oakridge weave throughout the community and connect to the natural areas surrounding the Glenmore Reservoir. There are many green spaces within Oakridge. Louis Riel School is located in the heart of the neighbourhood. Restaurants, shops and grocery stores are all nearby. Southland Leisure Centre has a wave pool, slides, gyms, arenas and a climbing wall. This public facility is only a 5-minutes away. Oakridge has an active community association. Access to 14 Street West and Macleod Trail are both quick. Calgary Transit LRT trains depart regularly for downtown from Anderson LRT station, and buses run through Oakridge and travel to the LRT station and South Centre Mall. 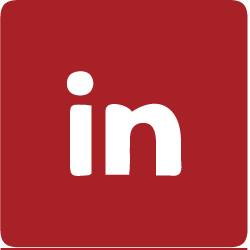 View all current Oakridge real estate listings above. Or contact us to learn more about this SW Calgary community.